The Colorado Cemetery Directory reports that the grave of Maggie Titus is located east of Colorado Springs, just north of Highway 94 in Section 9, Township 14 South, Range 64 West. However, according to granddaughter Mary Titus Cantrell, Maggie's twins, who died at birth, are buried there. Mary's father, Thomas V. Titus, born in 1900, remembered their birth and death, so they were probably born about 1906-7, Mary says. The twins, probably girls, were said to have been buried north of a hill on the west side of Curtis Road, about 0.6 mile north of Highway 94. If there were markers, they have now disappeared. Charles Beetham pointed out the general location of the grave, northeast of the intersection of a former fence line and a faint, curving road track in a field filled with soapweed. According to GPS-derived geolocation (accurate to within 10 meters), the graves' approximate coordinates are latitude 38°50'49.9"N and longitude 104°33'23.0"W.
Beetham, a stepgrandson of Maggie Titus, says his stepfather, Murriel A. "Buster" Titus, showed him the grave site the late 1940s. He recalls that it was one girl who is buried here and that she was probably less than a year old. He believes the burial took place about 1911-12. Margaret A. "Maggie" Titus (1870-1958) and her husband, Perry Henry Titus (1865-1913), are buried in Evergreen Cemetery, Colorado Springs. 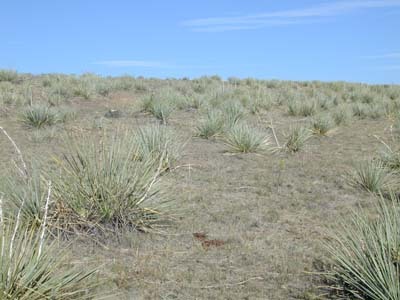 They homesteaded land northwest of the corner of Curtis Road and Highway 94. In addition to the twins, they had 12 boys and three girls.